A while ago there was a discussion about blocking top level domains for which there was no entry in Outlook's top-level domain list. As I recall it was done using binary within a registry entry and the actual registry entry was dependent upon which version of Outlook one was using. I'm seeing a lot of spam coming from a variety of trade domains. Which is to say that sometimes the spam is from @stateliquid.trade and sometimes from other.trade domains. Is there a way to devise a registry entry that would handle every domain that ended in ".trade" regardless of what followed the "@" symbol? Can I end it the registry to block, like we can do with top-level country domain? The registry edit you are thinking of adds UK and EU to the Junk Mail filter's Blocked Top-Level Domain list. It won't work for the new TLDs as it only supports two letters. 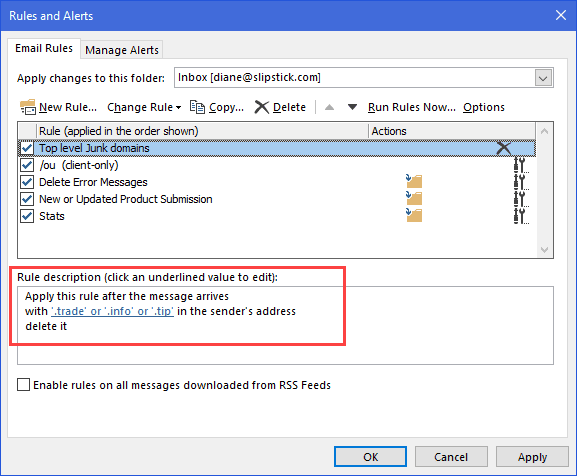 Outlook does not support wildcard filters, so you won't be able to use a rule for @*.trade. However, you do two options. Another option is adding .trade to the block senders list. Open Junk Email Options, Blocked Sender tab and add .trade to the list. To avoid lost messages, peruse the Junk Email folder now and again and add valid addresses to the safe list or if using rules, as an exception. If the solutions above don't work for you, you can use an ItemAdd macro or a run a script rule to look for the TLD. This macro is added to ThisOutlookSession and checks the top-level domains (the letters after the last dot) for any in the Select Case statement. If a TLD matches, it moves the message to the junk folder. If you'd rather delete the messages, use Item.Delete instead. This macro should be pasted into a new Module. After adding it to the VBA Editor and saving, create a new rule with the Run a Script action then select this script. The advantage of using this in a rule instead of the rule above is that this checks for the TLD. It will skip messages from bob@ny.tradesmen.com. Copy then paste the macro into ThisOutlookSession. Diane, if we are ever in the same city, I owe you a dinner at the best restaurant in town. Your tips have saved me time and again. But this one isn't working. I have ".website" (no quotation marks) in my blocked senders list, but I just got an email from name@domain.website. Does this not work for certain versions of Outlook? I use hosted exchange (not sure what version they are on, but it is relatively recent) and locally I have an Office 365 subscription, so I should have the latest and greatest Outlook installed. Using Windows 10.